[SatNews] The ISS-RapidScat instrument has been in orbit seven months, and forecasters are already finding this new eye-in-the-sky helpful as they keep watch on major storms around the globe. RapidScat measures Earth's ocean surface wind speed and direction over open waters. The instrument's data on ocean winds provide essential measurements for researchers and scientists to use in weather predictions, including hurricane monitoring. The NASA instrument arrived at the International Space Station (ISS) on September 23, 2014, providing a new resource for tracking and studying storms ranging from tropical cyclones to nor'easters. RapidScat has kept busy in 2015's already active Southern Hemisphere hurricane season and the Northern Hemisphere's winter storm season. According to Bryan Stiles, lead for RapidScat science data processing at NASA's Jet Propulsion Laboratory, Pasadena, California, "RapidScat data is now used by meteorological agencies around the world, including the U.S. Navy, the National Oceanographic and Atmospheric Administration [NOAA], and the European Organization for the Exploitation of Meteorological Satellites, among others," he said. "Wind data obtained by RapidScat have been used by NOAA to detect gale force and storm force conditions and issue warnings to shipping. The wind data is available to both forecasters and scientists. RapidScat data is used to support real-time weather prediction and to improve the models scientists use to predict both short-term weather and long-term climate trends." From the space station, this orbiting scatterometer instrument uses radar pulses reflected from the ocean's surface from different angles to measure ocean surface roughness, which is then used to determine surface wind speed and direction. This vantage point, combined with the fact that the space station orbits Earth every 90 minutes, also allows RapidScat to provide observations on how ocean winds vary over the course of the day. "Most Earth observing satellites are in polar, sun-synchronous orbits, meaning they observe the same locations at the same two local times of day with a regular repeating pattern," said Doug Tyler of the RapidScat team at JPL. 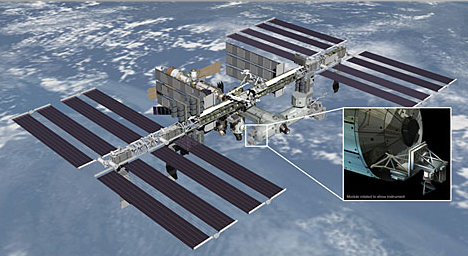 "Because of the unique orbit of the space station, RapidScat observations occur at varying times of day with an irregular repeat period. RapidScat sometimes sees things several times in a row. The ISS orbit provided three overpasses of [Tropical Cyclone Nathan] in 23 hours, allowing RapidScat to capture changes in wind speed and direction as the storm developed." The Joint Typhoon Warning Center (JTWC) forecasts tropical cyclones in several oceans and is also using ISS-RapidScat data. On March 15, 2015, at 0428 UTC, JTWC noted, "RapidScat showed that [Tropical Cyclone Nathan's] strongest winds (still assessed at 40 knots) remain in the northern periphery of the system, with significantly weaker winds in the southern portion." It's helpful to know where the strongest winds are in the system to enhance warnings, especially if they are affecting land or in a shipping channel. The same week, RapidScat provided surface wind data on the most powerful tropical cyclone to affect the Southern Pacific island nation of Vanuatu. After Tropical Cyclone Pam became an extra-tropical cyclone and moved near New Zealand, RapidScat continued to provide the location and speed of the strongest surface winds, which assisted with warnings. 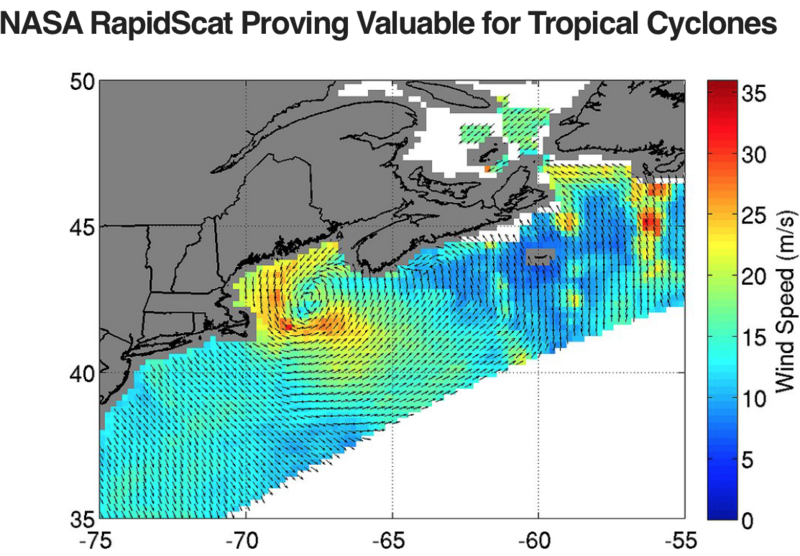 Earlier this year, RapidScat also provided wind data on a nor'easter that affected New England and triggered blizzard warnings on January 27 and 28. The wind data captured on the intense system showed the strongest winds on the first day near 78 miles per hour (35 meters per second/126 kilometers per hour) as it moved along the coast, stretching from eastern Long Island, New York, to southern Nova Scotia, Canada.